Studies are now showing a close relationship between animal abuse and future acts of violence both at home and in the community. A horse adopted from Habitat for Horses comes with an honest assessment. We don’t hide anything from you. Our goal is to find a horse that fits into your lifestyle, your home and your heart. Reasonably, rescue horses know that they’ve been rescued. There is a sense of appreciation which is exhibited, and becomes evident, in their willingness to understand requests. Where respect is reciprocated, a true human-horse partnership will develop, and a journey will begin. Do you need assistance with horse abuse? Contact your local law enforcement right away! In order for the horse to receive help, you must do this first! Tell them exactly what you saw, the address, a description of the horse and the people involved. If you can’t find an address, tell them the road it was on and how far from an intersection. 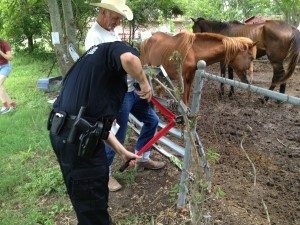 An innocent horse might be saved because a special someone saw what was happening and called law enforcement. You might be that “special someone” that saves a horses’s life. Even $15 a month can help keep a single horse fed for 4 – 6 days. There are many ways you can volunteer with us, and all make a difference in the lives of horses.